Cícero João de Cézare, nicknamed Cicinho ( Si-sin-yo) (born June 24 1980 in Pradópolis, São Paulo (state), Brazil), is a Brazilian football (soccer)er who plays as right-back for A.S. Roma. In 2005 he won the Confederations Cup with the Brazil national football team. He was one of 23 players called in to the Brazilian squad for 2006 FIFA World Cup. In 2005, he won the FIFA Club World Championship, playing for São Paulo Futebol Clube. After that, he joined Real Madrid for €4m. In the 2006-07 season, Cicinho suffered an extensive injury to his Anterior cruciate ligament and sat out for over six months. His comeback to not only the pitch, but also starting eleven, was marked on Sunday, April 29 2007 against Athletic Bilbao where he assisted Ruud Van Nistelrooy's first goal with a cross, and played a part in Ruud's second goal as well. Real Madrid went on to win the game 4-1. In the 2007-08 pre-season, the full-back was pushed down the pecking order at former club Real Madrid under new coach Bernd Schuster. Michel Salgado and Sergio Ramos have been used on the right during most of Real's pre-season to date, and Cicinho realized he could be due for a season bench-warming at the Bernabeu. He therefore requested to the club hierarchy to move to the Italian capital club who had been following him for some time. However, with the financial power of Liverpool FC, Chelsea FC and Sevilla, all interested in the wingback, a move to Roma seemed to become increasingly unlikely. Sevilla and Chelsea, in addition, also counted on the fact they could offer players that would attract the attention of the Real coach Bernd Schuster, offering wingback Daniel Alves and Arjen Robben respectively in exchange for Cicinho and a cash sum to attract Real's attention. However Cicinho was reported to have been adamant about moving to Rome and allegedly told Real that he would either move to Roma or would stay at Real Madrid. After a deal of 8 million euros had been agreed between A.S. Roma and Real Madrid, the latter changed their mind about selling the player at the last minute, claiming Cicinho would be featuring in the club's plans after all. 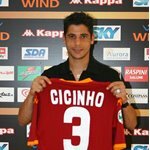 On 22 August, 2007, Cicinho signed for A.S. Roma for a fee up to 11 million euros. Cicinho signed a 5 year contract with the capital club worth up to 4 million euros a year including bonuses. He made his official debut in a Roma jersey on the first matchday of Serie A against US Citta di Palermo, coming on to substitute Ludovic Giuly in the second half. Roma ran out as 2-0 winners.